Christopher Connell, has sent a second report on today's Legislative Forum on Climate Change in the U.S. Capitol. There is clearly a long and difficult road ahead, but his story does a nice job in capturing the optimism that there is a growing consensus on two critical points: First, global warming is indeed a serious problem for all countries, rich and poor. Second, action is possible. The appeal from China and India for greater access to technology and funds to help contain their greenhouse gas emissions is especially interesting--more rapid technology diffusion and financial assistance to developing countries strikes me as an important part of a global grand bargain to be struck on climate change. With the U.S. capital suddenly gripped by winter’s snow and ice, it seemed the elements were out of sync Wednesday for a gathering of lawmakers from around the world to map strategy for combating global warming. But in other respects, both the setting – the august, Beaux Arts Senate Caucus Room with its white marble Corinthian pilasters and gold leaf filigrees on the ceiling – and the sentiments were far brighter and rosier than anyone could have predicted a few months ago at such a forum in Washington, D.C. Senator after senator, and business leader after business leader, stood up to say a new wind is blowing in these precincts on the topic of what to do about global warming. Even Sir Nicholas Stern, the British economist and treasury official who last fall penned a 657-page report warning of an economic catastrophe if the world lets climate change take it course, pronounced himself more of an optimist these days. And Virgin Airways dashing Richard Branson, who last week ponied up a $25 million prize for the scientist or company that can figure out a viable commercial way to reduce net production of greenhouse gases to zero (see NYT), was just one of many who said the United States has an indispensable role to play in facing this monumental challenge to the health of the planet. Never mind the 1997 Kyoto protocol, which the United States – like China and India – never signed. Things are more serious now, the politicians and the experts agreed, and it’s time to move on. With Democrats now controlling both houses of Congress and President Bush signalling that he may be ready to change his tune on global warming, it’s a new day in Washington. But amid the harmony and words of encouragement, there also was some real politique and intimations that the road ahead won’t be easy, no matter that the science of global warming now appears settled. 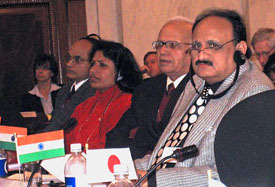 Most of the 80 legislators at the conference were from the G8 nations – leaders of the industrialized world – and fast growing developing countries Brazil, China, India, Mexico and South Africa. Several speakers, including Nicholas Stern, said that since global warming is a problem foisted upon the poorest countries in the world by the richest, it is incumbent upon the wealthy nations to take on most of the responsibility and cost of ameliorating it. Legislators from China and India pointedly asked for help from the developed world with the high costs of technology needed to power their growing economies without further damaging the environment. Stern, the British economist, said, “It’s surely right that the rich countries take the lion’s share of the responsibility for funding” a 30 percent reduction in carbon emissions. He also defended environmental steps China already has taken, including slapping an $8,000 tax on SUVs sold in Beijing. “China is reforesting, not deforesting,” Stern said. Later, during a session where business leaders spoke about their efforts to combat climate change, Branson, the British entrepreneur, also praised China for its one-child policy, which he called a “sacrifice…that had an enormous effect on global warming” by limiting population growth. “In any balancing of the books, that should very much be taken into account,” Branson said. The forum heard from a parade of U.S. lawmakers who support strong federal action to reduce carbon dioxide emissions. The highlight of the forum’s opening day was when Sens. John McCain (R-AZ) and Joseph Lieberman (I-CT) made their entrance, with flashbulbs popping as they waited just inside the door for a moderator to hurry the last delegations to complete their opening statements. Lieberman, Democrat Al Gore’s running mate in the razor-thin election of 2000, said that “recent events give us some confidence that we here in the United States are finally moving in the right direction” on global warming. He made this prediction: “The Congress of the United States will enact a nationwide law mandating substantial reduction in greenhouse gas emissions before the end of this Congress or early in the next.” The end of the 110th Congress will coincide with the end of the Bush administration in 23 months. McCain, who lost a bid for the GOP presidential nomination in 2000, is considering a second run in 2008 for the White House. He told the forum that the debate over the scientific evidence on global warming “is over. Now the question is, what do we do?” He said U.S. lawmakers will not be able to sell the public on the need for tough measures to combat global warming unless India and China are parties to an international deal, as well. The forum draws to a close on Thursday, with the international legislators planning to release a consensus statement on a framework for a new, post-Kyoto international agreement on what do so about climate change. 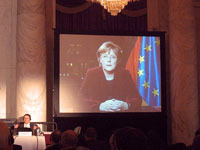 German Chancellor Angela Merkel, in a video address to the forum, said she was eager to hear their recommendations as she prepares the agenda for the G8 meeting in Germany in June.